In Sanskrit “Adho” means “downward”, “mukha” means “facing”, “Vrksa” means “Tree”, “Asana” means “Posture”. 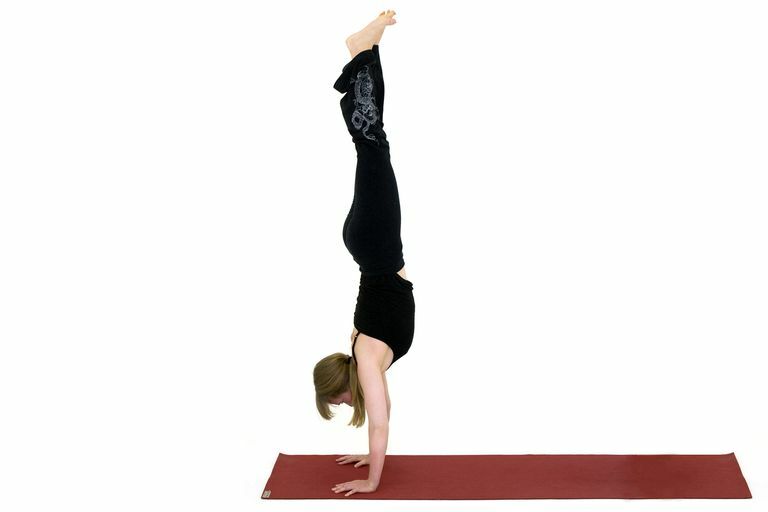 The English name of this asana is “Handstand Pose”. Start in Adho Mukha Svanasana. Bring your feet together at the middline; spread your palms and press them into the floor. Stretch through the sides of the waist and fortify your legs. Start to lift the heels, shifting some of your weight into the balls of the feet. Step your right foot forward halfway to your hands and bringing your shoulders over your wrists. Allow your right knee to bend. Keep the ball of the right foot on the floor but lift the heel. Press down firmly through your hands and lift your left leg into standing splits. Remember to lift your left inner thigh toward the ceiling and your leg straight, like as arrow. Wrap your biceps forward. Push firmly down into your hands and make your arms completely straight, like pillars. Find a focal point or drishti, on the ground, a few inches in front of your hands. Keep your arms firm. Bend the right knees deeply and take a small hop off the right foot. It is paramount that as you transition weight onto your hands, you lift up through the inner left thigh. Draw the low belly into support the pelvis. Do not aim get your legs overhead; instead, aim to place your pelvis, you will often backbend and find balance elusive. Eventually, you will be able to bring the right leg parallel to the floor into an inverted Utthita Hasta Padangusthasana. At this stage, don’t lift the right leg higher-it will serve as an anchor and keep you from flipping over. Once you have the right leg parallel to the floor, internally rotate the thighs, drawing them energetically into the midline. Your legs should feel like like scissor blades: bolted firmly into their common point (the pelvis) and moving along, but not away from, the midline. Once you have found balance, draw your legs together. Push down into the hands and actively reach up through the feet and legs. As you hug your legs into the midline, move the tailbone and the tops of the buttocks toward your heels. This will introduce length to the lumbar spine. Draw your low ribs toward the frontal hipbones to prevent any backbending. Make your body feel like an inverted Urdha Hastasana. Grow your taller by reaching your legs strongly up and away from your rooted and stable palms. Hold for 5 to 8 breaths. To release, step your right foot down, then your left, and take Pada Hastasana (Foot-to-hand-Pose) to stretch the wrists. Note: In handstand, distribute the weight evenly from your outer palm to your inner palm by pressing equally into the mounds at the base of each finger. Avoid cupping the hands, so that there is no unnecessary compression in your outer wrists. Keep your upper arms firm and your elbows straight to prevent buckling and instability. Reach up strongly through the feet, legs, and tailbone while engaging the core so that you do not dump into your low back, creating “banana back” and compression in the lower spine. Practice at a well until you are comforatable being upside down. What practicing without a wall, start by bringing the second leg no higher than parallel to the floor-it will act as an anchor and prevent you from falling over into a backbend. Spotlight effects: Arms, wrists, shoulders, spine, and overall balance. Energizes, builds confidence, hones attention and focus, shifts perspective, strengthens your happy body, and reverses the effects of gravity on your spine. Helps to relieve minor depression. It strengthens the arms, wrists as well as the shoulders, making them more agile and flexible. It helps in increasing stamina and overall body balance. It improves circulation of blood in the entire body. It stretches the abdominal muscles and is therefore beneficial in reducing tummy fat when practiced regularly. Calms the brain and can effectively help relieve mental stress and mild depression. Since this asana is not very easy to perform, especially for beginners, a few handstand precautions to keep in mind. These handstand postures requires good arm balance and therefore to begin with, practice with the support of a wall to avoid toppling over and getting hurt. Practice this postures only 3-4 times initially, until shoulder strength increases. Pregnant and menstruating women should avoid performing this asana completely . People who have existing shoulder, back and neck injuries or suffers from problems like high blood pressure, heart problems, and headaches should also avoid this asana.